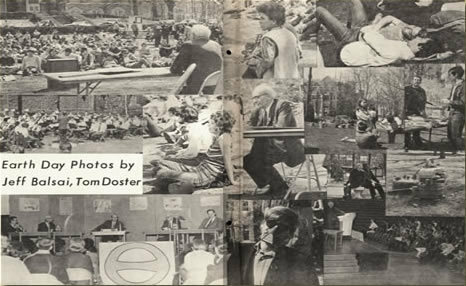 Images from Lehigh's first Earth Day celebration, from the Epitome, 1970. "I have witnessed the most amazing change in demand for ecological understanding during the last 50 years. Even 15 years ago, only the few young men and women, who were natural born naturalists, became ecologists. Now almost any college or university that has shown interest in things ecological is flooded with environmentally concerned students. Also, many students, who do not intend to make a career in environmental studies and work, have become fully aware of the extreme emergency caused by man's drastic alteration of the ecosphere." In December 1969, the Lehigh Ecology Action Group (LEAG) was formed by faculty and students worried about the growing "environmental crisis." By January 1970, LEAG had nearly 100 students and faculty, including Francis Trembley, who retired the same year. Lehigh first celebrated Earth Day in 1970, as did the rest of the nation. Lehigh celebrated the 40th Anniversary of Earth Day this year. Interest in student environmentalism declined in the 1980s. Throughout the 1990s, concerns about the environment energized some students at Lehigh to agitate for recycling and other changes. In the past five years, new student environmental groups have formed at Lehigh. The Environmental Coalition (Eco) and Green Action both work to increase student involvement in environmental action, and advocate for sustainability. Students in the Green House live in an "environmentally themed community" dedicated to daily environmental living. Taking small steps, students, along with faculty and staff, are working to make Lehigh University a more environmentally friendly place to live and learn.